#6-19 Nicely restored wall-mounted antique ball rack. 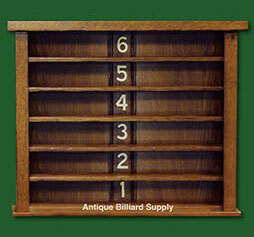 Universal design from early 1900s would compliment a variety of antique pool tables. Solid ash construction. Shelf numbers in gold leaf provide a nice accent for the medium brown finish.